Singer-songwriter Sheryl Crow opened the doors to her 1920s Spanish Revival home in the Hollywood Hills for a spread in Architectural Digest last year. Now she’s selling it and the two other houses on the 11-acre property for about $16 million. I always love it when we get to see more of an estate like this. Let’s look! The main house, where Sheryl lives with her sons Wyatt and Levi, was built in 1924. She bought it first, in the late 1990s. Two years later, she acquired the bungalow and cottage nearby and created her own private compound. They must have been having a sale on rugs when she was furnishing the living room. All the woodwork in the house is beautiful. For more photos and information, check the listing by Myra Nourmand of Nourmand & Associates and read the article by Mayer Rus in Architectural Digest (photography by Roger Davies and Jim McHugh). 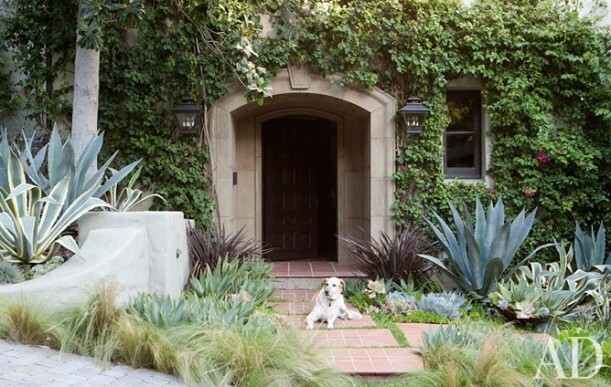 You can see my original post about it here: Sheryl Crow’s Romantic Hollywood House. P.S. I also wrote about Crow’s Cross Creek Farm in Nashville. When I think of that house, it’s the fish tank in the kitchen that I remember! It’s one of the more inviting upscale places I’ve seen. I think it’s the dog in the doorway that makes it seem homey. What a lovely house. It looks really warm and cozy. I love the library too. If I had the means, I ‘d but his in a heartbeat. Love Sheryl Crow – her house is wonderful. I especially appreciate the antique bicycle over the fireplace (rather than a big-screen TV!) It’s also nice to see a superstar who has a library in her house. Lovely house. It certainly seems more “homey” than most houses in this price range. The burning question is, WHERE DID SHE GET THAT DUVET COVER!!?? I must have it. The Spanish style house is great, but I want that Craftsman. Love the woodwork. It will be interesting if someone splits up the property eventually. I think there are three houses? I don’t blame her for buying them all. You know who your neighbor is. She’d done a great job making them look homey. Those rugs in the guest house crack me up. Maybe her boys were playing Hot Lava Monster with them? Of course, that explains it! I used to play that too when I was little. Beautiful! I love her decor, in both houses. I wonder why she is selling? Nice Spanish styled home. My favorite room is the library. I could spend hours in there. Wonder where she’s going to move? Only a few have the money to buy in this price range. It’s surprises me how homey and warm feeling it is. I think she used to be a teacher so I guess she really appreciates books. I do love Spanish Colonials, and this one really does look homey and comfortable. Unlike so many beautiful celebrity homes, as a mother of boys I can actually imagine two little boys running around this one. Those kitchen cabinets actually look original to the home. With the original tile on the staircase (and, from your original post, I remember she still had the original 1920’s tile in her bathroom), it wouldn’t surprise me if these were the originals too! In some ways I feel sort of romantically inclined to the fact that something perfectly functional hasn’t been torn out for the sake of modernization! She certainly has the money to do that if she wanted, but I secretly admire her even more for keeping the old ones! I agree. Looks like at some time the wall behind the cabinet was taken down to open the kitchen up to a sitting area, where the original kitchen would have been smaller and contained. I’m not sure about that light green color, though – doesn’t seem to fit particularly with the rest of the Spanish style house to me. Both of these houses are gems. Love it… love her library. So often I cringe when I see celebrity homes, so this one was a pleasant surprise. Both of the houses look comfortable and attractive. It did seem that the library had very few books in it–maybe “den” would be a better term for it. Also, that alphabet wall in the kid’s room looked like a giant Ouija board–between that and the oversized stuffed animals it seems kind of a creepy place to sleep. But seriously, I love the quality, spaciousness, and architectural quality–tiles, windows, etc. that make up these houses. It’s a fine house – but not really worthy of a spread in AD – but this is due to the celebrity factor. The ‘gingerbread’ on the balcony you’re referring to is an evocation of the Swiss chalet, a style subset that was popular in the Craftsman era. What a lovely, homely house. Looks so cozy and comfortable, love the sitting room! It does have some nice, warm features like the library and dining room, but I also see a sort of identity crisis going on with the house, landscape and a few of the spaces. I know location is key, but 16 million seems steep, especially for the kitchen. I agree – the kitchen is pretty (what we can see of it) but certainly doesn’t look any more upscale than a typical $400k house. I am always amused by “libraries” belonging to “book people” with few books and empty shelves with knick knacks (not that I have anything against knick knacks). It’s like the lavishly decorated “living rooms” with no TV (yes, yes, “they never watch”) and no reading lights by the sofa and chairs (they never read?). So what do they do in those big rooms, I wonder? Where do they really live? I guess I’m alone. I found the Spanish style house uninspiring, and I do love that style. The art in the dining room was really depressing, to the point of being a creepy place to eat. Give me the interiors of the craftsman any day! To me, the pool is probably the best part of the house. The rest of it, I’ve seen before or don’t particularly like. She also put her 154 acre farm in Tennessee on the market. Maybe she’s downsizing! . I going back through some of your posts and found this lovely home. Despite some of the comments here the landscape is pretty typical of similar style homes in southern Calif., and I agree that it certainly seems more “homey” than most houses in this price range. The architectural features are beautiful and I love the staircase tiles. If she did use a designer they at least showed some restraint which I appreciate. I certainly wouldn’t turn my nose up at it or criticize the owner’s taste. If I had a choice though I would love that Craftsman guesthouse. From what I can see here–I just love everything about it.